without a board and starts as soon as the first ivory piece is placed. It is not allowed to break the connextion of the pieces in a way that ´islands´are being created. (a new insect) or if they want to move a piece wich already was in the game. 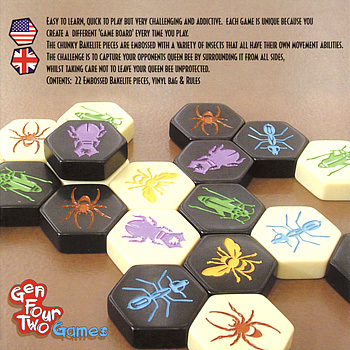 The object of the game is to surround the queenbee of the opponent (without your own queenbee being surrounded). The player who succeeds in that wins immediately. on top of eachother. The ant can move infinetely. Hive is a game with easy rules but with great strategic and tactic depth. That´s why Hive is as well loved by people who play more abstract boardgames (such as chess and go) as by people who don´t. Hive has been awarded internationally several times. The mosquito is an expansion that gives Hive an extra dimension.